Mia was content to share her big, bright room with her baby brother, but now that they are older--and he is messier--she seeks a new space of her own. A sweet sibling story about one fed-up big sister who wants to find a space of her own, perfect for fans of Ashley Spires's The Most Magnificent Thing. Mia loved her big, bright room . . . until she had to share it with her new brother. With Brandon's toys, books, and even underwear taking up space, Mia has finally had it. I'm moving out! There are lots of new and interesting spaces she could settle into--the bathroom, the basement, even a pillow fort. But something is always missing. What could it be? 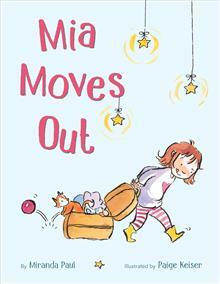 Tackling the oh-so-relatable topic of finding a space of one's own, Mia will inspire siblings everywhere to work together as a team. Because sometimes the best place of all is a shared one. Miranda Paul is an award-winning children's author. Her titles have received starred reviews from School Library Journal and Publishers Weekly, in addition to being named to several recommended and best of reading lists. Miranda makes regular appearances at schools, libraries, and bookstores, and has been a guest presenter at the Library of Congress Young Readers Center. Miranda also serves as Mentorship chair for We Need Diverse Books(TM), volunteers for Books for Africa, and is a regional advisor for the Society of Children's Book Writers and Illustrators (Wisconsin chapter). She believes in working hard, having fun, and being kind. Learn more about her current and forthcoming titles at www.mirandapaul.com and follow her on Twitter at @Miranda_Paul. Paige Keiser also moved out at age nine- she packed a bandanna, a pocketknife, and a peanut butter sandwich. She moved back in twenty minutes later. Paige is the illustrator of many picture books for kids. Visit her website at www.paigekeiser.com.